THE KESI RUG - Kesi is a term of Chinese derivation used to refer to Kelim tapestries woven in silk. 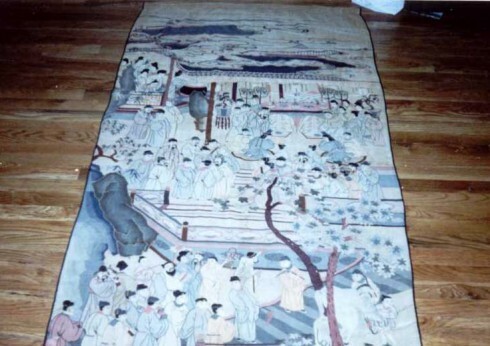 Kesi is a term of Chinese derivation used to refer to Kelim tapestries woven in silk. An alternate name for the style is “slit-tapestry,” and in fact the name Kesi, or K'o-ssu, literally translates to "cut silk," a reference to the visible cut threads that distinguish the borders of Kesi pictorial design. 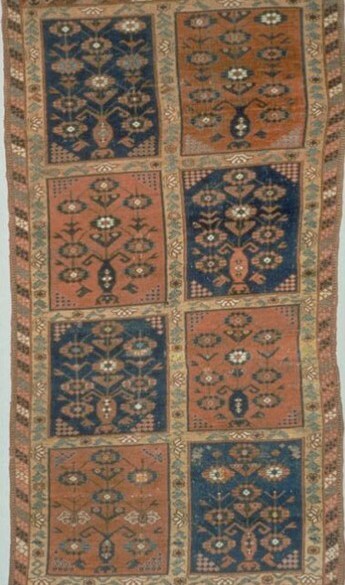 It is believed that the Kesi style arose as a synthesis of traditional Chinese and Near East weaving techniques that followed trade routes along the Silk Road. Beginning with the Han Dynasty of the 3rd century BC, and gaining extreme popularity by the Song Dynasty of the 11th century AD, the weaving style was being used to create the rarefied silk art of China’s imperial families—everything from fine clothes to beautifully, minutely detailed wall hangings. The form spread to Japan during the Ming Dynasty (1368-1644), and by the late Qing Dynasty (1644-1912) production in China had become sufficiently centralized to produce not only imperial art, but also extremely popular, though extremely expensive, clothing and household goods for the wider market. Like many of the highest forms of early tapestry art, Kesi’s roots are imperial, and for centuries, so was its exclusive market. Like the 17th century Savonnerie carpets of the French monarchy, and the later 19th century Hereke Carpets of the Ottoman Empire, the original Kesi textiles were constructed for sole use of the ruling class. In China, they were produced for imperial use by official imperial silk workshops. Among the clearest evidence of this long exclusivity are records of the 17th century Qing Dynasty, which even at that relatively late date still show contracts for blue and yellow Kesi robes to be made twice per by the Imperial Silkworks for sole use by the emperor. First, raw silk stretched across a wooden frame is used as the warp. Then, wefts of boiled-off silk are woven directly onto the warp using bobbins and a small shuttle. With incredible patience, craftsmen weave wefts into landscapes, animals, and portraits with astonishing levels of detail. Part of the challenge comes in working at such a small scale. Every time a color is changed, so too must the weaver begin an entirely new shuttle. And because weft threads do not stretch across the textile, they must be handled with great care and aligned individually along often vanishingly small lines of the design. The technique has been compared to embroidering directly onto the warp, but with the significant exception that by using the Kesi technique, the embroidery becomes not merely decorative, but integral to the structure of the textile. It should be noted that Kesi is not only a weaving technique, but also the description of a form of art, the oldest of all the woven textile arts in China. As it co-evolved with Chinese visual art, many of its designs bear sticking resemblance to traditional images in Chinese painting. Kesi are still produced today, primarily in China and the Himalayas, and both the modern pieces and the antiques have become highly collectible for their high-contrast, boldly rendered, beautifully detailed woven designs.